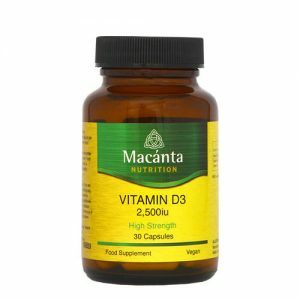 Macánta Vitamin D3 capsules offer 2500iu of cholecalciferol, considered the most natural and most active form of Vitamin D. Vitamin D is a fat soluble vitamin which is required by the body for a number of functions. Also needed to promote the absorption of calcium, this vegan form of vitamin D3 (cholecalciferol) is what the body naturally produces when the skin is exposed to sunlight. Given the small amounts of regular sunlight exposure for most of us here in Ireland, it is often impossible to maintain your required levels of this vital vitamin, which cannot even be met through diet alone. Given that nearly all cells in the immune system depend on Vitamin D to function effectively, and that as we age our bodies become less efficient at absorbing Vitamin D, this supplement could benefit as part of a healthy diet and lifestyle.